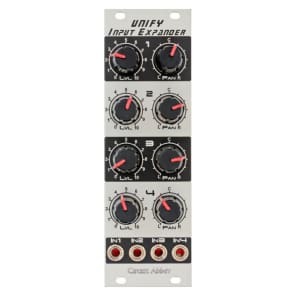 The Unify is a 4-channel stereo mixer with selectable line or module level output and separate headphone output. The 4 input channels are module level with audio-taper level pots and constant-power pan pots. The output can be either line or module level, so this module can be an output mixer or a utility mixer. The headphone output has a separate level pot. There a clip LED to indicate overloads. Ample expansion capabilities have been designed into the module, and a series of expansion modules is planned. The Unify uses high performance LM4562 amplifiers which have excellent noise and distortion specs. One of the best amplifiers available today. The Unify also boasts sealed pots and enclosed jacks. No scratchy controls!